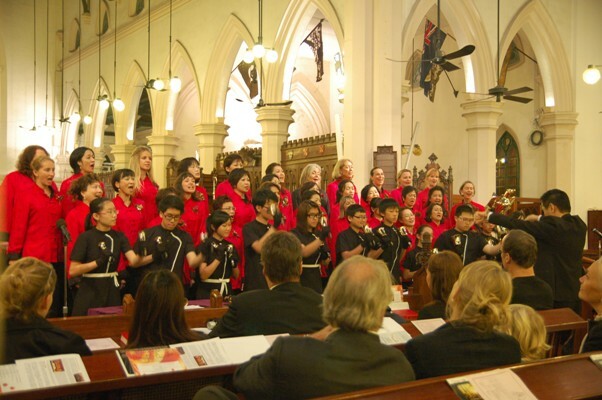 With sold out concerts titled “Beautiful December” at Helena May (December 9th) and St John’s Cathedral, the Hong Kong Women’s Choir raised money for HOLF (Home of Loving Faithfulness), an organization which provides life-long holistic care for abandoned people in a home-like setting. More information about the organization can be found at: www.holf.org.hk. Grace Notes also host an a capella concert at Club Lusitano on December 17th and sang at private functions to raise more money for HOLF. The event at St John’s Cathedral also saw our collaboration with the Hong Kong Youth Bell Ringers Group for one of the pieces we performed: “Throw Open Your Shutters”. The bellringers also did three pieces on their own and were very well received by the audience.